This weekend I had the pleasure to announce through National Ad 2 Social Media and to my Ad Fed and Ad 2 colleagues that Ad 2 Minneapolis Won 1st Place Progams from the National American Advertising Federation. This award goes back to representing your Ad 2 club nationally and getting to compare notes and compete with other talented clubs on Club Operations, Education, Membership and more. Programs is something that Minneapolis has seemed to stand-out in the crowd with over the years. Our themes are always different and we always come up with something new each time to keep reinventing the concept of Advertising and Career Education in our very own local community. We like to network, after work it’s nice to have an adult beverage or cold drink and if we can take away something that involves an agency showing us what they did in a case study, or the newest software they are using to edit video or even a role or discipline you never thought about becoming- then Ad 2 has accomplished what we have set out to do! Our winning submissions for the 2012 1st Place Programs included the required 3 events and 1 special program, began with Drive Thru event held in October 2011. The record-breaking-attendee Campbell Mithun event whom people are still talking about that was in November 2011. Martin Williams event held January 2012 where 2 Gingers Whiskey and a 20-second video contest clearly stands out in the crowd. Then finally, the annual pub crawl which was held in May 2011 on LynLake known as Rock the Yacht. Individually these events stood out to Allie Eide and I while choosing for the submissions in January 2012, because they were all very diverse, yet had this special theme and quality about them we liked. 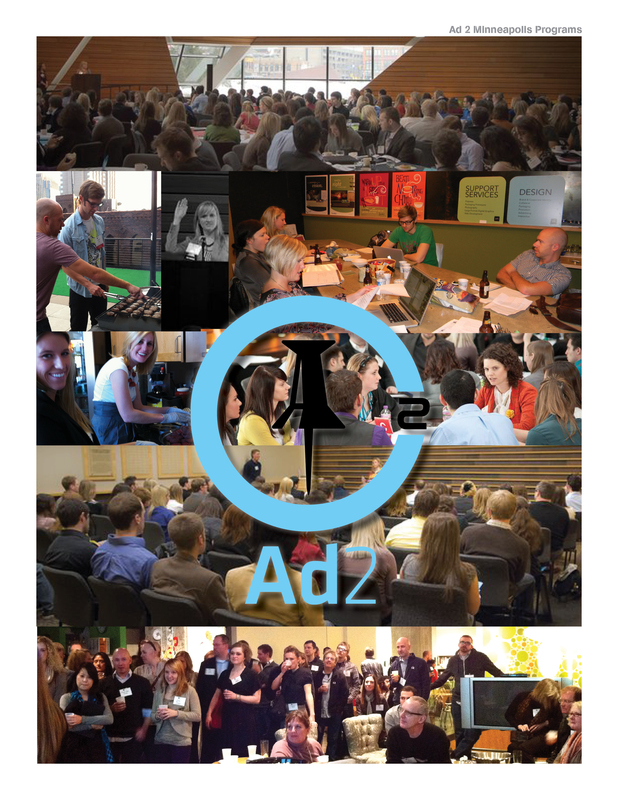 Ad 2 continues to grow and each event keeps out doing the other. The agencies and talented businesses locally keep stepping-up to show us what they can show the ad community and the committees that run the events are getting more passionate and stronger. It’s hard to imagine how it used to be back when I would be planning events solely for about 30-50 people and it was before the hash-tags where enabled for events. Now our venues on average need to hold 150 and we are continuing to channel new groups through social media! Thanks to the individuals that help the events before become a success over the years. It not only are the talented volunteers that are active in the committees and events now, but the ones that I worked with back in 2008, 2009 and 2010. Each one of us have different career paths leading us to finding a job, starting our 60-hour work weeks or even being laid-off. Work-life-volunteer-balance is crucial and it has brought many different people in my life. This next generation volunteer group will continue to exceed expectations and I have faith in the on-going leadership involved with Ad 2. I’m happy to share this 1st Place Programs honor with all of you! Stay tuned for a few more rocking events to finish off my last few months as your Ad 2 President and Programs Director. OLSON will be hosting the Thursday, April 5th event and this one will be one for the books. Register today! Then the final HOORAY of the 2011-2012 Program year will be the OlympiAD² Pub Crawl, so put May 17th on the calendar and register before you forget. Thanks again for reading and participating with our nonprofit organization. This MN Design Gal won’t be going away, the party planning, ideas, innovation and leadership lives in my blood. 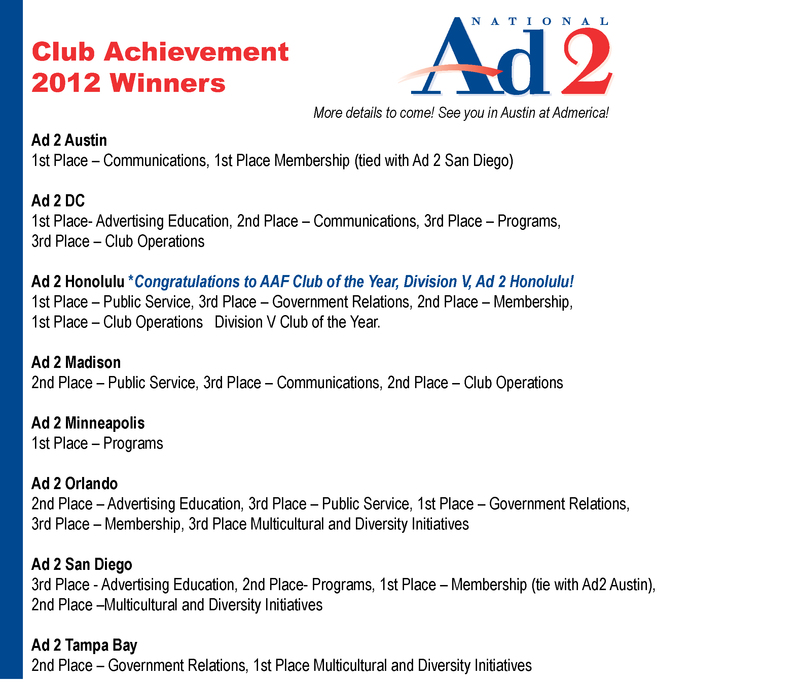 Congrats again to Ad 2 Minneapolis! Now what’s for dinner- Chicken? Continue to read and learn more about Tricia on her blog 12 PT fine print. This entry was posted in networker, people-centric, the advertising life and tagged Ad 2, Ad 2 National, Campbell Mithun, Chicken, Drive Thru Productions, martin williams, Olson, Party Planning, Pub Crawls by mndesigngal. Bookmark the permalink.